Although all Christians share a mutual belief in the existence of God, there are considerable differences in their beliefs concerning the actual character and attributes of God. Christians are not the only people to believe in a heavenly Father. The concept is embodied in almost every religion on earth. Although most people worship God in word, they do not worship the same God either in attributes character, or in perfection. Some believe he is some type of mysterious spirit; without body, parts, or passions. Others have accepted the mysterious Trinitarian god of the pagans and believe that the Father, Jesus, and Holy Ghost are one and the same God. Many consider the eternal heavenly Father to be some kind of mysterious spirit and force that works in the Universe; but, that has no direct contact with man. The Brighamite (Utah) church believes that God was once a man like us and progressed to His current perfections. Brigham even taught that God was Adam and that he brought wives from another planet. This absurd doctrine remains in that church. Many have misunderstand the description of the Father as “a personage of spirit.” Like him, we are also personages of spirit. It has been objected that “God is a spirit.” (John 4:24) Angels are also “spirits sent forth to minister to them who shall be heirs of salvation” (Heb. 1:14). Yet, Abraham and Lot mistook angels and God for men (Gen. 18:2, 5, 16-20; 19:1, 15) John the Revelator mistook one for God (Rev. 22:8, 9). Our soul is comprised of a spirit and a physical body joined by the breadth of life. When we die our spirit is taken back to the God that made it and judged according to whether we knew God, obeyed the Gospel, and remains faithful to the laws of God. These await the resurrection in the bosom of Abraham (death). All others wait with the spirits in prison (hell). The heathen (Gentile) concept of heaven and hell originated with Nimrod and was brought through Babylon, to Rome, and to Christianity through Constantine. The concept of a fiery hell originated with Nimrod the first king of Babylon. At the resurrection, the spirit and the body are once again united– never again to be separated (except for those of the second death). God appeared to His people throughout Biblical history; until through sin and disbelief they drew away from God. God walked with Adam in the garden of Eden (Gen. 3:8). Abraham mistook him for a man, invited Him into his tent, and feasted with Him (Gen. 18). Jacob wrestled with Him and saw him face to face (Gen 32:24, 28, 30). “30 And Jacob called the name of the place Peniel: for I have seen God face to face, and my life is preserved.” God spoke with Noah (Gen. 7:1). He conversed with Moses face to face, as a man converses with his friend (Ex. 33). “11 And the LORD spake unto Moses face to face, as a man speaketh unto his friend. And he turned again into the camp: but his servant Joshua, the son of Nun, a young man, departed not out of the tabernacle.” God appeared to Ezekiel in the likeness of a man (Ezek. 1:26, 27). What does God look like? Look in the mirror. You were created in the image and likeness of God. “And God said, Let us make man in our image, after our likeness.” (Gen. 1:26) Even as “3… Adam… begat a son in his own likeness, after his image.” (Gen. 5:3) Only the degradation of the human body has caused man to look less like God and to possess less of the divine nature. God has always spoken to His people; when they are faithful and obey His law. “God said” is found 71 times in the Bible. The “Lord said” is found 285 times in the Bible. The Bible is a history of God’s relationship and direct communication with His people. 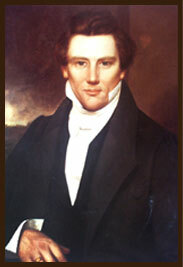 God and Jesus appeared to Joseph Smith and to James J. Strang. The proof of this meeting is found in their works. They taught the same as the prophets of old and contrary to the pagan doctrines that had entered the Christian church through Constantine. It is only in relatively modern times that man has not had a direct relationship with God. In the beginning, God walked and talked with Adam (Gen. 3:8). The generations from Adam to Noah includes: (1) Adam lived 930 years, (2) Seth 912, (3) Enos 905, (4) Cainan 910, (5) Mahalaleel, 895 (6) Jared 962, (7) Enoch was translated at 365, (8) Methuselah 969, (9) Lamech 777, and (10) Noah 950. Lamech, who was 9th from Adam and the father of Noah, lived 721 years after Adam died. Seth 112, Enos 210, Cainan 305, Mahalaleel 360, Jared 492, Enoch was translated after 57, Methuselah 726. All of these men were living on the earth at the same time. It is easy to understand how all had a perfect knowledge, and communication with, God. 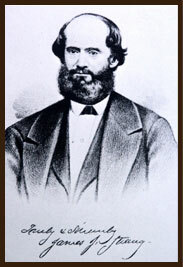 Enos was the grandson of Adam. Noah was 84 years old when Enos died. Enos, Cainan, Mahlaleel, Jared, Methusalah, and Lamech, were all acquainted with both Adam and Noah. A perfect knowledge of God was passed directly from Adam to Noah. God spoke personally with many, if not all, of these men. From the flood to Abraham was 352 years. Abraham was 58 years old when Noah died, 210 when Shem died, 148 when Arphaxed died, 178 when Salah died, 239 when Eber died, 48 when Pelig died, 78 when Reu died, 101 when Serug died, 49 when Nahor died, and 135 when his father, Terah, Died. Again, notice how easy it was for a perfect knowledge of God to pass from Adam to Noah and then from Noah to Abraham. Abraham was born about 2,000 years after the garden of Eden and about 2,000 years before the birth of Christ. A knowledge of God passed easily from father to Son as He spoke with His people during each generation. God spoke to Joseph and to Jacob evidently until their death. Jacob’s blessings upon his sons were prophetic [from God]. Thirty years after going into Egypt they were taken captive and held as slaves for 400 years; until Moses. See the, “Divine Priesthood,” page for greater detail on the great apostasy and the restoration. Evidence of that apostasy is found in the adoption of pagan gods, worship, and ceremonies given Christian names. The greatest of all commandments is a love of God. The worship of anything other than the God Abraham, Isaac, and Jacob is idolatry; whether an idol, or something imagined by the mind of man. Even the world is an idol if it is of more importance than God. Probably the most elaborate, mysterious, and confusing doctrine on God was developed by Saint Athanasius for the new universal, Catholic church, organized by the Roman Emperor Constantine in the early part of the fourth century. Most Christians subscribe to the concepts of this creed of Saint Athanasius. After establishing the new Catholic religion and its creed, Constantine set about canonizing the Scripture to agree with the pagan concepts embodied in this creed. “2 Let us here observe, that three things are necessary, in order that any rational and intelligent being may exercise faith in God unto life and salvation. “3 First, The idea that he actually exists. “4 Secondly, A correct idea of his character, perfections and attributes. He further explained the attributes of God in lecture four, noting that God is the fountain of knowledge and is like none other. “Knowledge. Act 15:18. Known unto God are all his works from the beginning of the world. Isaiah 46:9,10. Remember the former things of old; for I am God and there is none else; I am God, and there is none like me, declaring the end from the beginning, and from ancient time the things that are not yet done, saying, My counsel shall stand, and I will do all my pleasure. “6 Secondly, Faith, or power. Heb. 11:3. Through faith we understand that the worlds were framed by the word of God. Gen. 1:1. In the beginning God created the heaven and the earth. Isaiah 14:24,27. The Lord of hosts has sworn, saying, Surely as I have thought so shall it come to pass; and as I have purposed, so shall it stand. For the Lord of hosts has purposed, and who shall disannul it? and his hand is stretched out, and who shall turn it back? “7 Thirdly, Justice. Ps. 89:14. Justice and judgment are the habitation of thy throne. Isaiah 45:21. Tell ye, and bring them near; yea, let them take council together: who has declared this from the ancient time? Have not I the Lord? and there is no God else beside me; a just God and a Savior. Zeph. 5:5. The just Lord is in the midst thereof. Zech. 9:9. Rejoice greatly, O daughter of Zion; shout, O daughter of Jerusalem: behold, thy King comes unto thee: he is just, and having salvation. “8 Fourthly, Judgment. Ps 89:14. Justice and judgment are the habitation of thy throne. Deut. 32:4. He is the Rock, his work is perfect; for all his ways are judgment: a God of truth, and without inequity: just and right is he. Ps. 9:7. But the Lord shall endure forever: he has prepared his throne for judgment. Ps. 9:16. The Lord is known by the judgment which he executes. “9 Fifthly, Mercy. Ps. 89:15. Mercy and truth shall go before his face. Exodus 34:6. And the Lord passed by before him, and proclaimed, The Lord, the Lord God, merciful and gracious. Neh. 9:17. But thou art a God ready to pardon, gracious and merciful. “10 And Sixthly, Truth. Ps. 89:14. Mercy and truth shall go before thy face. Exodus 34:6. Long suffering and abundant in goodness and truth. Deut. 32:4. He is the Rock, his work is perfect; for all his ways are judgment. A God of truth and without iniquity: just and right is he. Ps. 31:5. Into thy hand I commit my spirit: thou hast redeemed me, O Lord God of truth. “18 In view, then, of the existence of these attributes, the faith of the saints can become exceedingly strong: abounding in righteousness unto the praise and glory of God, and can exert its mighty influence in searching after wisdom and understanding, until it has obtained a knowledge of all things that pertain to life and salvation. Joseph also explained the term Godhead. “2 There are two personages who constitute the great, matchless, governing and supreme power over all things–by whom all things were created and made, that are created and made, whether visible or invisible: whether in heaven, on earth, or in the earth, under the earth, or throughout the immensity of space–They are the Father and the Son: The Father being a personage of spirit, glory and power: possessing all perfection and fulness: The Son, who was in the bosom of the Father, a personage of tabernacle, made, or fashioned like unto man, or being in the form and likeness of man, or, rather, man was formed after his likeness, and in his image;–he is also the express image and likeness of the personage of the Father: possessing all the fulness of the Father, or, the same fulness with the Father; being begotten of him, and was ordained from before the foundation of the world to be a propitiation for the sins of all those who should believe on his name, and is called the Son because of the flesh–and descended in suffering below that which man can suffer, or, in other words, suffered greater sufferings, and was exposed to more powerful contradictions than any man can be. But notwithstanding all this, he kept the law of God, and remained without sin: Showing thereby that it is in the power of man to keep the law and remain also without sin. And also, that by him a righteous judgment might come upon all flesh, and that all who walk not in the law of God, may justly be condemned by the law, and have no excuse for their sins. And he being the only begotten of the Father, full of grace and truth, and having overcome, received a fulness of the glory of the Father-possessing the same mind with the Father, which mind is the Holy Spirit, that bears record of the Father and the Son, and these three are one, or in other words, these three constitute the great, matchless, governing and supreme power over all things: by whom all things were created and made, that were created and made: and these three constitute the Godhead, and are one: The Father and the Son possessing the same mind, the same wisdom, glory, power and fulness: Filling all in all–the Son being filled with the fulness of the Mind, glory and power, or, in other words, the Spirit, glory and power of the Father–possessing all knowledge and glory, and the same kingdom: sitting at the right hand of power, in the express image and likeness of the Father–a Mediator for man–being filled with the fulness of the Mind of the Father, or, in other words, the Spirit of the Father: which Spirit is shed forth upon all who believe on his name and keep his commandments: and all those who keep his commandments shall grow up from grace to grace, and become heirs of the heavenly kingdom, and joint heirs with Jesus Christ; possessing the same mind, being transformed into the same image or likeness, even the express image of him who fills all in all: being filled with the fulness of his glory, and become one in him, even as the Father, Son and Holy Spirit are one. All prophets of God teach alike. As God is changeless, the same from eternity to eternity, so are the spiritual laws and teachings of His holy prophets. James J. Strang continued to teach on the character, being, and attributes of this one true and living God. For a detailed review of his teachings in the Book of the Law, Refer to the page “Book of the Law of the Lord”–The True God.